The engineers of today need CAE data management solutions that can give them a fast, consistent and comprehensive access to simulation data – new or modified CAD models from the design departments, new or revised FE meshes and computational models, current simulation results and reports. 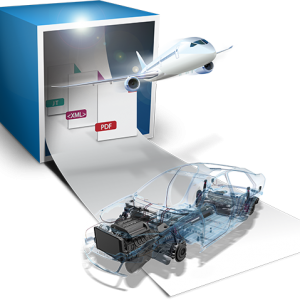 SimData Manager provides an efficient and seamless access to all simulation relevant data on the complete CAE process chain. This way, calculation engineers can easily keep track of an ever increasing number of simulation runs across disciplines – and as part of a multi-site collaboration – across the entire supply chain. Mastering the challenges of the CAE process chain. Allows the export and import of CAE models (e.g. center panels, FE meshes, submodels, includes) in SimData Manager. The integration of suppliers for offline work for is easily possible. Allows importing of CAD data & PDM structures in SimData Manager. Enables the mapping of the design view (CAD structure) to the CAE structures of the calculation, thus ensuring an efficient and comfortable update as the design changes. Reuse existing CAE parts and the packaging of data blocks for external service contractors. Interactive, graphical tool to define and execute standard procedures in the calculation. Semi-automatic report generation in HTML and PPT format. Data storage and data synchronization of MKS / MBS models. Allows access to all simulation data from the command line and their integration into batch scripts. Enables synchronization of offline data with the SDM database contents. Allows transparent, encrypted storage of user data for the highest safety requirements. Adding self-defined scripts and functions by the customer. Debugger for the efficient development of robust inhouse Phyton scripts. SimData Manager enables bi-directional tracking (traceability) of all CAE data from the underlying CAD data to the final simulation report. Calculators always know which versions of CAD data were the basis for their various intermediates of simulation models and the calculation results obtained from there and can easily refer to the specific meta information stored in SimData Manager. CAE engineers are informed about new data versions and can decide if those changes are relevant for their respective CAE models and simulations. Simdata Manager is the software solution for integrating all disciplines in a superordinate CAE data management system, and therefore to be the “backbone” system for all global distributed computing activities. SimData Manager saves on the one hand time and money, on the other hand it increases the transparency of all computing activities and increases the quality and efficiency of all involved calculation processes. More information about the modules of SimData Manager? Transparent CAE data management system to increase user acceptance. 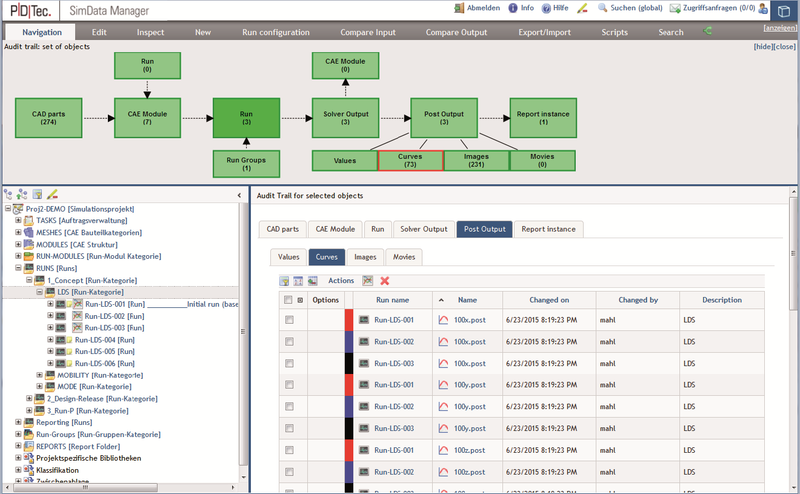 The intuitive interface of Simdata Manager is designed to access simulation data and results easily. The Simdata Manager supports the standardization of data and processes for reuse across all simulation activities. Thresholds, load cases, dummies and material data – everything can be shared and centrally managed through libraries and made available. The powerful automation features of SimData Manager help the engineers to work. SimData Manager follows the calculation process – not vice versa. The Python-based scripting interface makes SimData Manager open to all needs of the user. 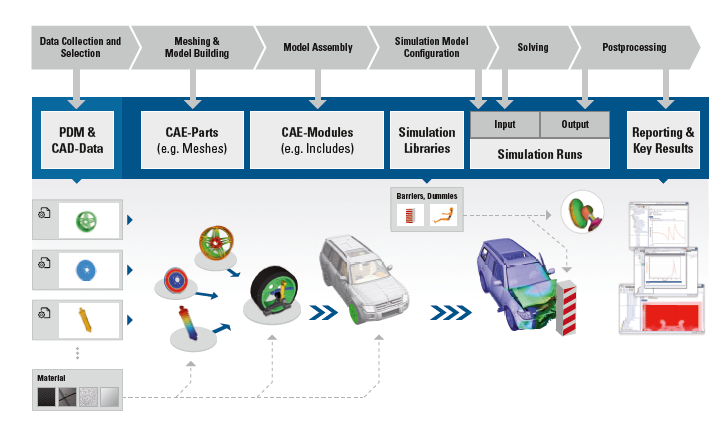 Therefore the simulation process and the tools along the discipline-specific CAE process chain are easy to manage, modify, control and automate. Engineers and analysts will have more time for valuable simulation work. More information about SimData Manager? Use cases in the video overview!